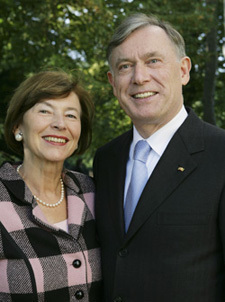 The University of Notre Dame’s Nanovic Institute for European Studies and the Notre Dame Institute for Advanced Study (NDIAS) will welcome Dr. Horst Koehler, former president of the Federal Republic of Germany, and his wife, Mrs. Eva Luise Koehler, to the University for a three-day visit that will include a major public lecture by Dr. Koehler. Titled “The Whole is at Stake,” the lecture will be held Sept. 28 (Wednesday) at 7 p.m. in the Carey Auditorium of the Hesburgh Library. Dr. Koehler will focus on essential lessons to be learned from the international financial crisis with a particular emphasis on ethical questions and the German and European experiences. A public reception in the concourse of the Hesburgh Library will follow the lecture. In addition to his public lecture and several meetings with Notre Dame students and faculty, Dr. Koehler also will offer an informal talk titled “Understanding Africa: A View from Europe,” Sept. 29 (Thursday) at 2:15 p.m. in the auditorium of the Hesburgh Center for International Studies. This talk, organized by the Department of Africana Studies, the Africa Working Group of the Kellogg Institute for International Studies, and the NDIAS, is based on Dr. Koehler’s experiences in key international positions and in public service working for improvements in Africa. President of the Federal Republic of Germany from 2004 to 2010, Dr. Koehler also served as managing director of the International Monetary Fund from 2000 to 2004. Mrs. Koehler, a tireless advocate for the study and understanding of rare diseases, will offer an informal talk, “Rare Diseases: A Challenge for our Societies,” to students and faculty of the University’s Center for Rare and Neglected Diseases on Sept. 30 (Friday). Her talk is organized by the Center and the NDIAS. Additional information is available on the websites of the Nanovic Institute and the NDIAS. Originally published by Notre Dame News at newsinfo.nd.edu on September 20, 2011.